Sportplan provides Australian Football coaches with free access to a suite of powerful coaching tools to make your life easier, so you can spend less time planning and more time doing what you love - coaching. 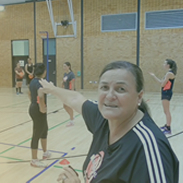 Sportplan is more than just a library of over aussie rules, afl Australian Football drills. Since 2002 we've made it our mission to build the best online coaching tools using the latest web technologies. These tools are designed to make planning easier for you and to help you improve the quality of your coaching.